Purchasing a pair of men’s brogue boots is a wise choice if you are ready to take your footwear to the next level of sophistication and timeless style. Brogue boots are great, versatile boots that can be dressed up or down giving them a lot of opportunities to shine throughout the season. They can serve as an in-between boot for the days you want a smarter look but where dress shoes may not be appropriate because of weather. The versatility of men’s brogue boots is a big plus as they can be paired with everything from a suit and jacket to selvedge denim. No man’s closet can be complete without a pair of leather dress boots and these Allen Edmonds brogues definitely fit the bill. As with most Allen Edmonds footwear these boots feature and impeccable attention to detail with their Goodyear Welt construction, leather lining and leather sole. The brogue design on the wing tip gives these boots a timeless look. The Dalton is perfect for anyone looking for elegant and beautifully handcrafted oxblood brogue boots. The Grenson Fred is a unique take on classic leather dress brogues that feature a handsome white rubber wedge sole. Grenson adds many different elements that really make the Fred standout. Our favorite of such details is the oversized brogue punching throughout the boot. Pair such uncommon style choices with high quality tan calfskin leather and you have a unique pair of mens brogue boots that still retains an air of elegance thanks to it’s amazing craftmanship. A stylish and versatile boot, these Ted Baker brogue lace up boots offer a unique look with their paneled leather and textile uppers. These carefully crafted pair of brogue lace up boots feature handsome broguing on a polished wing tip for an elegant look. The Ted Baker Sealls 3 are available in multiple leather colors so you are sure to find a pair you love. Timberland has made a great entrance to the men’s brogue boot game with their affordable Britton Hill wing tip boots. 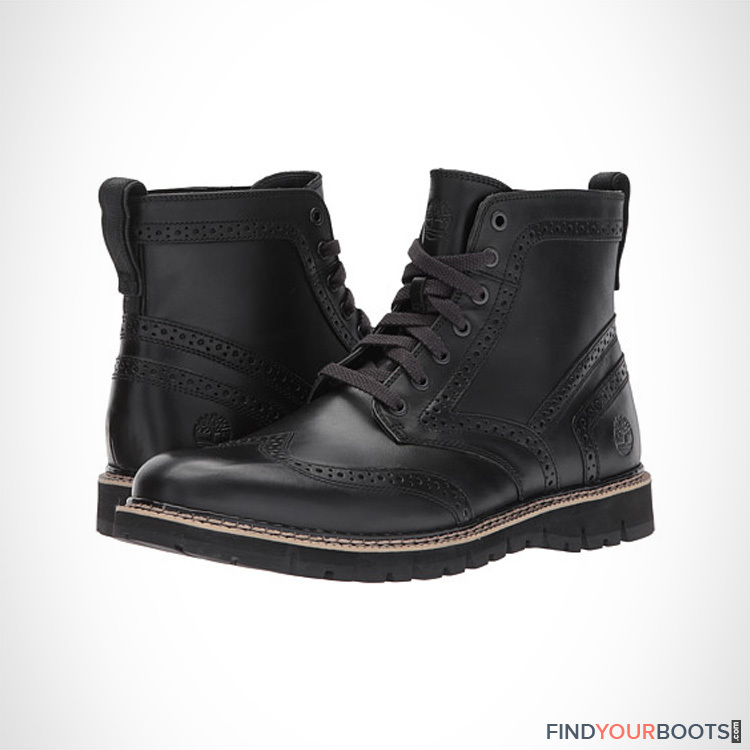 These are the boots for anyone looking for a more casual pair of black brogue boots with a street wear edge. We love these boots because of their athletic inspired Gripstick outsoles that provide traction on both wet and dry surfaces. 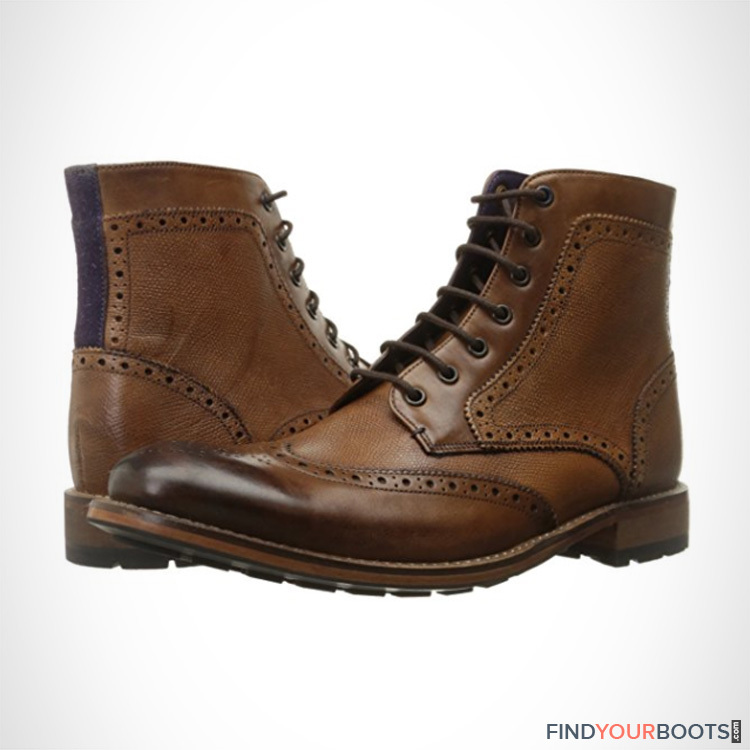 Florsheim offers a classic take on traditional wingtip boots with their Capital Lace Up Boots. We love these boots for their simplicity and time honored style. These are the boots to own for anyone looking for a dressier boot with a simple design and minimal embellishments. We love all of the small details these brogue lace up boots offer such as calfskin leather uppers, flexible rubber outsoles and a fully cushioned footbed. Vintage Foundry’s unique take on a “classic” is interesting as it is stylish. These brogue ankle boots fit more like a chukka boot yet feature an upscale wingtip brogue toe and attractive tan leather uppers. This mix of dressy and casual style is an easy way to class up your footwear with a pair of chinos or denim. Aldo offers an affordable pair of commando sole brogue boots with their Araewiel. These boots feature handsome cognac leather uppers and a tough lugged rubber sole. These boots are an easy way to give denim a smart look and your feet an instant touch of elegance. The commando soles make the Araewiel a great option for a night on the town no matter the weather. The Madison II Brogue boot feature the quality and style that Stacy Adams boots are known for. These black brogue boots feature milled leather uppers with white stitching throughout. The white stitching gives the boot a bit of an informal look while still maintaining it’s classic brogue boot touch with a beautifully crafted wing-tip toe. This pair of men’s black brogue boots is an easy way to smarten up any outfit. The best brogue boots are timelessly classy and versatile. Dress brogue boots up with a tailored suit for a sophisticated look in the fall and winter. This combination is great for the office, weddings and other special events. Or pair brogue boots with slim fitting or selvaged denim. Pin rolling your denim cuffs allows for the boot to really shine and showcase it’s stylish profile.